Recipes to Make Simple Pai Apples (Apple Pie) .Actually how to make a pie or in our example this is fairly easy apple pie. So in our cake recipe this time we make an apple pie that is simple, so easy in practice. If you have advanced can be combined or varied. Apples can be replaced with another material milk or cheese. For those who can not wait please read the recipe to make a simple apple pie below. How To Make K ulit pie: Random random all ingredients with a fork / knife / or tools for pie dough stirring, until well blended and bulleted item. Grease a mold for pie crust with margarine. Print dough, while press and press, trim, prick with a fork or a toothpick, so no bubbles when the oven. Pai Apple Stuffing: Heat the butter, put cinnamon powder and powder Spiku stir quickly. Enter apples, salt, sugar, lemon juice, stir stir, enter maizenna solution. Fill into pie shell printed, once filled can be closed again with the pie shell, or remain visible contents. Preheat the oven to a temperature generally less than 180 degrees. Bake the pie until cooked pie shell and turns a brownish color. Simple apple pie ready to be served. That's Recipes to Make Simple Pai Apples (Apple Pie) that you can try at home. 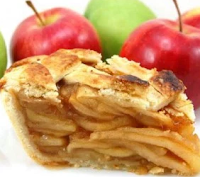 Although simple, it is equally delicious with apple pie in a restaurant or outlet sellers famous apple pie. Entries can be added to a mixture of other fruit eg raisins to taste sweet and sour. And keep in mind, too, when the pie apple will close with dough skin again, do not forget to rub the surface with egg yolk. 0 Komentar Untuk "Recipes to Make Simple Pai Apples (Apple Pie)"